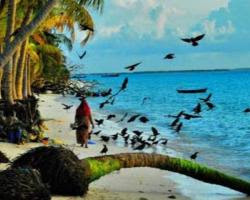 The 44-member Alliance of Small Island States (AOSIS) represents some of the world’s most vulnerable island nations fighting a virtually losing battle against rising sea levels triggered by global warming and climate change. A negotiating voice of Small Island Developing States, the Alliance of Small Island States, has membership drawn from all oceans and regions of the world, including Africa, Caribbean, Indian Ocean, Mediterranean, Pacific and South China Sea. According to the U.S. National Ocean Service, the two major causes of global sea level rise are thermal expansion caused by warming of the ocean (since water expands as it warms) and increased melting of land-based ice, such as glaciers and ice sheets. The oceans are absorbing more than 90 percent of the increased atmospheric heat associated with emissions from human activity, says the National Ocean Service. Rising seas, worsening coastal erosion, and increasingly powerful storms have forced small island states to climate-proof infrastructure projects in the Caribbean and the Pacific and even threaten the territorial integrity of low-lying islands, he said. “The devastation caused by the recent storms in the Caribbean are a reminder of how vulnerable small island states are, and how years of development and economic gains can be wiped out overnight, leaving these countries to start from scratch,” said Sareer, whose island nation has been threatened by sea level rise triggered by climate change. Described as “one of the world’s most geographically dispersed countries” and comprising more than a thousand coral islands scattered across the Indian Ocean, the Maldives has a population of nearly 440,000 people compared to India, one of its neighbors, with a hefty population of over 1.2 billion. The Maldives was devastated by the December 2004 tsunami, and according to one report, 57 islands faced serious damage to critical infrastructure, 14 had to be totally evacuated, and six islands were destroyed. A further twenty-one resort islands were forced to close because of tsunami damage estimated at over US$400 million. Addressing the UN General Assembly on Dec. 5, Ambassador Robert Sisilo of Solomon Islands, told delegates his country sat on the largest aquatic continent in the world, and had a huge maritime exclusive economic zone that was much larger than its land territory. The June 2017 Ocean Conference had represented a ray of hope, and the international community must accelerate that positive momentum, said Sisilo, calling on the Security Council to address the issue of climate change. Sareer told IPS the SAMOA Pathway, the small island state blueprint for sustainable development, calls attention to the crosscutting nature of climate change and sustainable development in areas as diverse as infrastructure development, agriculture, marine conservation, and climate adaptation. The follow-up and review of the pathway is scheduled to happen over the next two years. Meeting a financing goal of US$100 billion annually by 2020 is essential, and new partnerships with the private sector, non-governmental organizations, and other institutions can help to mobilize the resources, Sareer said. Small island states say required funding should be predictable, sustainable, adequate and easy to access. In this regard, the Alliance of Small Island States has been advocating for simplified access procedures for the Green Climate Fund, and also greater transparency on how the funds are allocated and dispersed, with a clear understanding of what constitutes climate financing. The Adaption Fund is important to small island states because the fund recognises the particular challenges that many islands face in addressing climate change. So far, 14 countries from small island states have seen their projects or programs approved by the fund for a total grant amount of US$96,951,733, including readiness grants. Projects in small island states account for around 22 percent of the total commitments of the fund. Given the size of small island states, Sareer said, projects are more likely to be small-scale projects. It is therefore essential that this characteristic is well understood and taken into account by the different funds under the Convention while reviewing proposals from such states. On oceans, Sareer said marine debris, plastics and micro-plastics, are a global problem, as are the more permanent impacts of deoxygenation and ocean acidification resulting from climate change. Meanwhile, Tourism and Fisheries, in island states, constitutes a huge portion of government revenue and the health of the oceans are directly linked to these industries.